Fractals aren’t actually on the syllabus – but they do offer quite a good opportunity to look at limits, infinite sequences, complex numbers (eg Julia sets etc), the relationship between maths and art and so on. 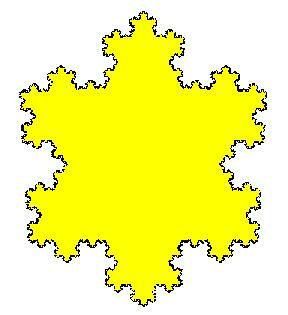 Even more amazing, the Koch snowflake has a fractional dimension – more than 1 but less than 2. There’s also the Dragon Curve – which is explained in a Youtube video. This allows students to see the beginnings of a fractal design from simply repeatedly folding a strip of paper. From this you can start to look at both Julia and Mandelbrot sets. Dan Pearcy has posted a fantastic blogpost on the topic – which explains how the amazing fractal nature of these shapes are generated. There are also some amazing Julia Set generators and Mandelbrot generators on Geogebra. All of this can lead onto the coastline paradox (or indeed, it might be a good place to start a lesson) – which asks can we ever actually measure the length of a coastline – because the more detail we go into, the longer the perimeter becomes. A good link to ToK knowledge.